Kathleen Dean Moore, Oregon author of Great Tide Rising and Piano Tide, and Megan Moody, a writer and educator who lives in rural Southeast Alaska, are contributors to Writers on the Range, the opinion service of High Country News. At low tide, the sea is still a quarter-mile away across a broad expanse of wilderness beach in Southeast Alaska. On the far side of the inlet, green mountains turn gray as a squall skids through. Seven women walk toward a lone pinnacle of rock on the beach. Its sharply eroded limestone, pocked and pocketed, stands almost 12 feet high. A bald eagle flaps off as we approach. The air temperature is 55 degrees Fahrenheit, water temperature is 51, and high tide is predicted for 3:08 p.m. We plan to climb onto that pinnacle of rock and perch there until the tide rises over it. We know this won’t be easy. Randomly distributed among us, ages 30 to 80, are three damaged eyes, two cranky knees, one sore back, and in my case, a deep fear of drowning. But we help each other clamber up, each deciding for herself how deeply she is willing to be submerged. Why are we here? Scientists generally agree that unless the world acts fast on climate change, warming water and melting continental ice will raise sea levels about three meters — almost 10 feet — by 2100. Yet in the current political climate, many continue to dismiss the scientific predictions. Even for those who accept the science, it’s hard to visualize three meters of rising water. So the seven of us are going to provide a shivering, living example of that rise. 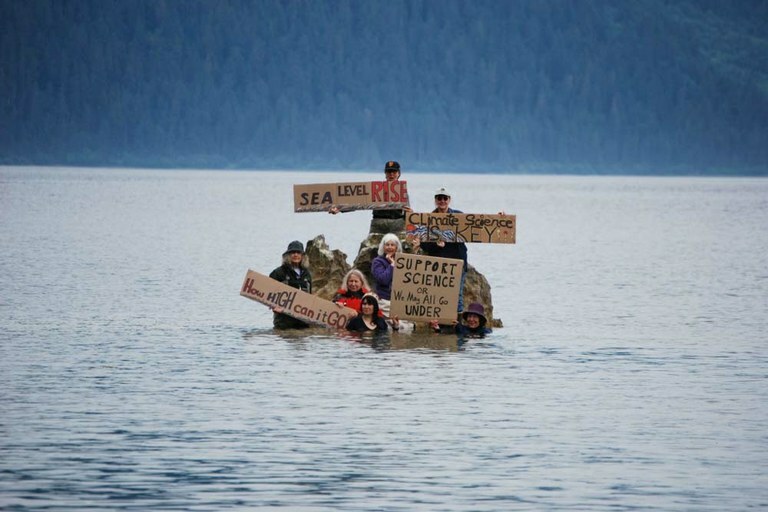 Alaskans and Alaskan Natives will be some of the first to experience sea level rise from climate change. Although rising tides are very different from rising sea levels, they are similar in one major respect. The tide will rise whether we deny it or not. The same with rising sea levels. No attack on science, no denial of global warming, no alternative facts, will hold back the sea. So what does three meters of sea-level rise look like? How does it feel? When you hear the tide rush up the beach, you feel unsettled, as if someone were sneaking up on you in the dark. When the tide rises to your knees, what you feel is pressure, as the sea presses your waders to your calves. When the tide rises to your waist, you start to feel cold, and you spread your arms to keep them dry, the way eagles do. When the water gets to your chest, your float-coat begins to lift, and you drive your fingers into cracks to hold yourself in place. We laugh, but it’s a nervous laugh. There are weak jokes about the Greek hero Prometheus, condemned to spend eternity chained to a rock in the sea while an eagle eats his liver — his punishment for stealing fire from the gods. Soon Molly, standing on the gravel, is engulfed to her shoulders. She holds her sign higher. 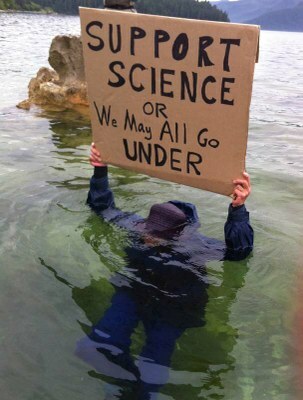 “SUPPORT SCIENCE or we may all go under.” I lift my sign higher too: “How high can the water go?” I learn the answer to the question as water begins to pour over the top of my waders. Before I know it, my socks are sloshing in cold saltwater. Even for those who accept rising sea levels, it can be hard to know what that will look like. “Take the picture and get us off this rock,” I say. By now, Molly is entirely underwater, bobbing up and down to grab quick breaths. Her hat floats off and sinks. The hem of Megan’s skirt is floating up to her armpits and she begins to sputter. “Take the damn picture,” I say again, and now the question is, what was the plan to get us off this rock? We help each other climb higher on what is now a narrow pinnacle, and I tighten my grip. Our photographers turn rescuers, and we heave and flop into their boat, graceful as walruses. It may be that Alaskans are especially nervous about sea-level rise because climate change is coming fast and furious here. With little sea ice to protect the shores, severe storms are already threatening to wash 31 Native Alaskan villages into the sea. And we want to call attention to more than Alaska. Already, rising saltwater driven by fiercer storms is swamping land in Bangladesh, Florida, Cuba and Houston, ruining agricultural fields, flooding homes, scrabbling at the foundations of great cities, contaminating drinking water, driving climate refugees inland. There’s no denying the danger and the damage. So here’s the biggest question: What deeper understanding, what sinking feeling, what shiver of cold up the spine is required, before people will rise like the tide against politicians and petrochemical industrialists who chain our future to the rock of fossil fuels?